The two governments have clashed over a range of issues, not least the Turkish detention of U.S. pastor Andrew Brunson on terrorism charges. LONDON — Turkish President Recep Tayyip Erdogan warned the U.S. on Saturday that his country does not respond to threats, a day after President Donald Trump sent the lira into freefall by announcing he would double the rate of import tariffs on Turkish metals. The two governments have clashed over a range of issues including the Turkish detention of U.S. pastor Andrew Brunson on terrorism charges, the U.S.-backing of Kurdish troops in Syria and Turkey’s intention to buy Russian defense systems. Turkey is also frustrated at U.S. unwillingness to extradite Turkish cleric Fetullah Gulen, who Erdogan accuses of staging a failed 2016 coup attempt. "You can never bring this nation in line with the language of threats," Erdogan told a crowd of supporters in the Turkish town of Unye on the Black Sea coast. "I am once again calling on those in America: It is a pity that you choose a pastor over your strategic partner in NATO," he said. Brunson, 50, was arrested in 2016 but was recently released from prison and put under house arrest. He still faces a sentence of up to 35 years if he is convicted at his ongoing trial. Trump and Secretary of State Mike Pompeo have repeatedly called for his release, while Erdogan has said the U.S. should respect Turkey’s judicial process. Relations with Washington worsened further Friday when Trump tweeted that he had authorized a 20 percent duty on aluminum and 50 percent duty on steel. "Our relations with Turkey are not good at this time!" he noted. On Saturday he repeated his call and described the situation as a "war of independence." "If there are dollars under your pillow, take these out. If there are euros, take these out ... Immediately give these to the banks and convert to Turkish lira and by doing this, we fight this war of independence and the future. Because this is the language they understand," he said. The ailing lira had already lost one third of its value this year amid soaring inflation and unemployment as well as worries over Erdogan's wider control of the economy. 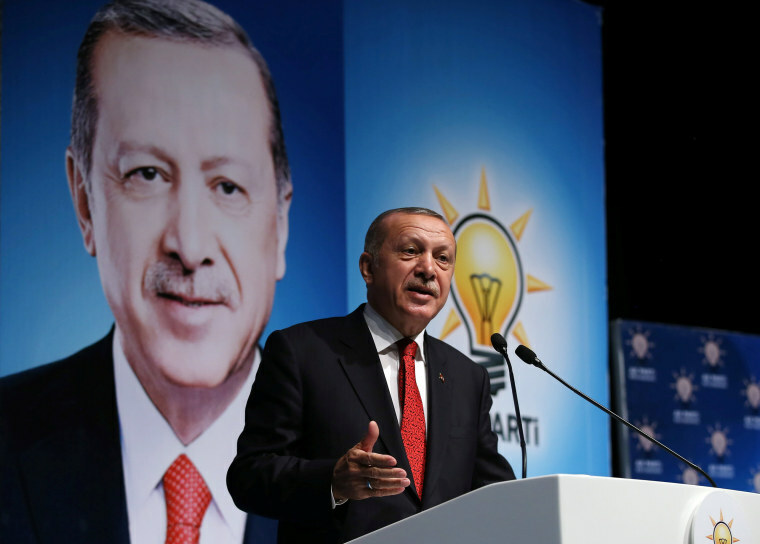 In an opinion article published in the New York Times on Saturday, Erdogan wrote that Turkey and the U.S. had been strategic partners and NATO allies for the past six decades and that his country had repeatedly come to America's aid. “Yet the United States has repeatedly and consistently failed to understand and respect the Turkish people’s concerns,” he wrote in the article, warning that Turkey had alternative allies. "Before it is too late, Washington must give up the misguided notion that our relationship can be asymmetrical and come to terms with the fact that Turkey has alternatives. Failure to reverse this trend of unilateralism and disrespect will require us to start looking for new friends and allies," Erdogan said. “Moving forward, we will abide by the same principle: Attempting to force my government to intervene in the judicial process is not in line with our Constitution or our shared democratic value,” he warned. A NASA scientist is behind bars. But Trump isn't tweeting about it. Turkey, home to the Incirlik air base which is used by U.S. forces in the Middle East, has been a NATO member since the 1950s. It is host to a critical part of the Western alliance's missile defense system again Iran. In a separate opinion piece in the pro-government newspaper Daily Sabah, Erdogan's spokesman Ibrahim Kalin said Turkey's efforts to solve the crisis with diplomatic methods have been dismissed by the Trump administration, warning that Washington might completely lose Ankara as an ally. "The U.S. runs the risk of losing Turkey as a whole. The entire Turkish public is against U.S. policies that disregard Turkey's legitimate security demands. Threats, sanctions and bullying against Turkey will not work," he said.